I was expecting something similar to the last author event I went to, the Garth Nix one, where we were sitting in the Waterstones cafe and having this intimate Q&A session. 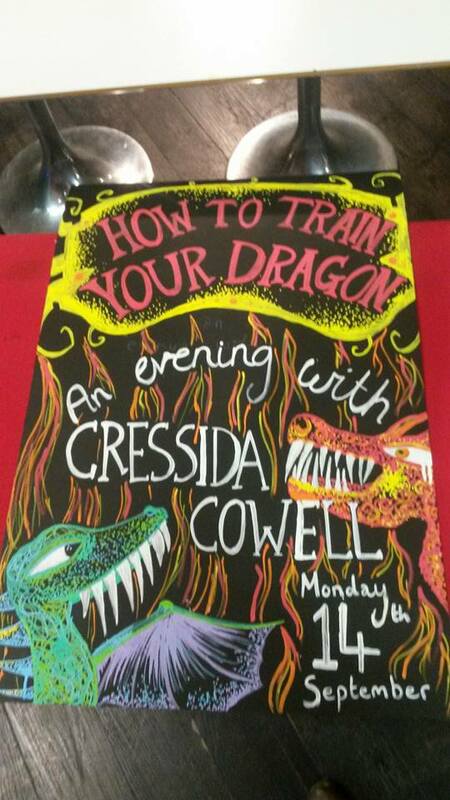 What I had completely forgotten, was that Cressida Cowell and the How to Train Your Dragon series, are aimed at children. Not matter how fantastic the books are, and can be appreciated by adults, they do, in fact, live in the children’s section. Which meant that I was sitting in Waterstones cafe, with five minutes to go, wondering where everyone else was, when the helpful cafe man tells me the event is in the large building round the corner, not the cafe. Thankfully, I made it on time, got my poster and my book, and since I was on my own, squeeze into a seat rather near the front. Oh, and as a bonus? 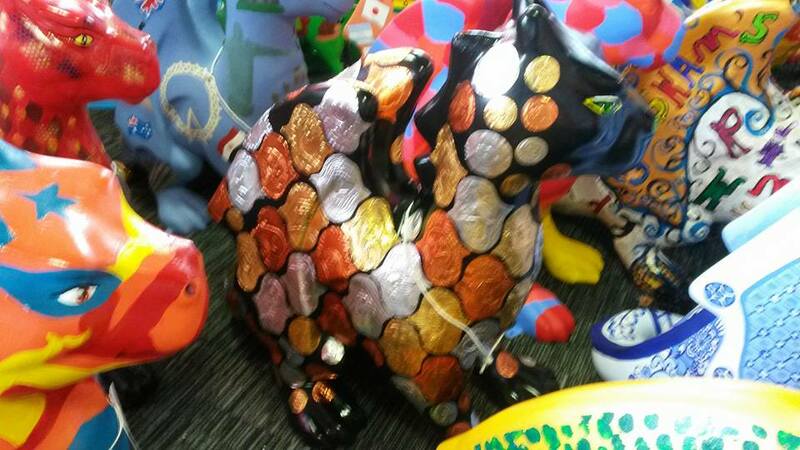 There were some of the GoGoDragons there, including my personal favourite, Webby! The schools that were attending the event (yes, some schools are awesome enough to bring their students to events like this) brought their GoGoSchoolDragons with them as well, so there were five big ones and five little ones. It was a lovely setting. And then Cressida herself came out, and she was simply fantastic. Just, awesome. When she spoke, it was clear to see the enthusiasm and love for what she does, and she really does love having all the kids around. She talked a lot about her own childhood, showing us pictures from when she would stay on this uninhabited island (because her dad wanted to bird watch) with her starting to write, aged approximately nine, and then giving the audience, largely made up of approximately nine year olds, advice on how to write stories, and be creative. And it wasn’t bad advice for us older ones either. 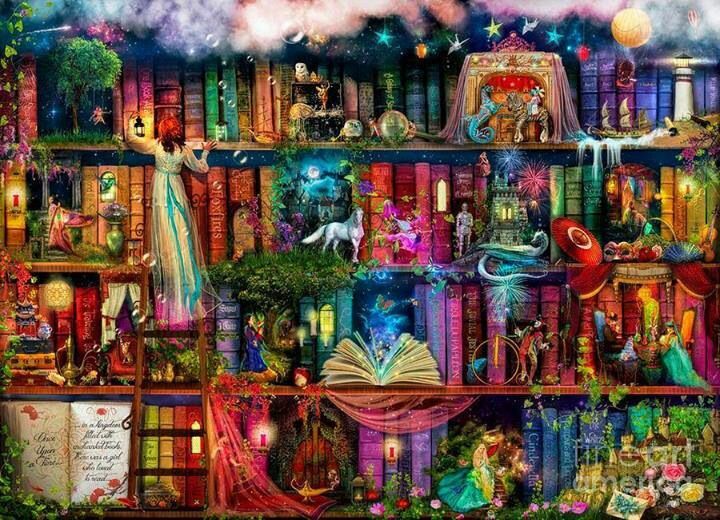 So, she showed us some childhood memories, she did some reading of the books, including the dragonese parts of the book where the adults had to cover their ears because it is not appropriate language for us to hear! She talked about vikings, she showed us some stories and map that kids had sent into her (apparently she gets a ton of letters and pictures like this and loves it). She talked a lot about inspiration, and where she gets her ideas from. I had no idea that she was illustrator as well as writer, and frankly it just make me respect her all that much more, but she talked about how she uses real life to inspire her. 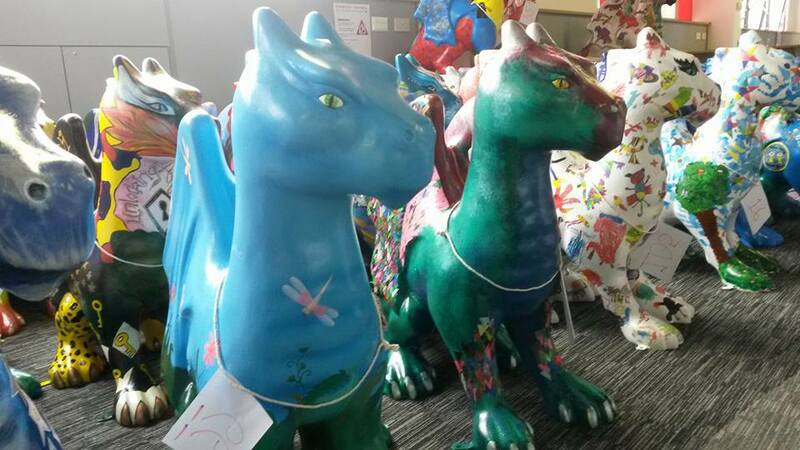 For instance, quite a few dragons that she’s come up with are blends or two or more creatures. The monstrous strangulator is made up of a fish that look like a grumpy man, and another fish that has a see-through head because it dwells on the ocean floor and needs to see the prey above it. The Giant Bee eater is a cross between a basking shark and a manta ray. As she kept saying, reality is often strange than fiction, and nature is more powerful than we are! She even, during her long talk, answered some of the questions that I had. For instance, in the films, Toothless is definately not as he is in the books. And that’s because in the books, Vikings have hunting dragons and riding dragons, but the riding dragon doesn’t turn up until book six or so. The film-makers were doing the film in 3D, and had this large expanse of sea and sky to play with, so they decided to combine Hiccup’s two dragon from the books (Toothless and Windwalker) into one dragon in the films that could fly from the start. And yes, she had always intended to have the slow reveal of the early adventure meaning more than you think they do, and everything ties together in circles and cycles. Of course there were questions asked by the audience. All kids, because lets face it, when kids are actually excited and involved in something, you let them run with it. And from this we learnt that this is the last book in this series, but Cressida loves the world she’s created so much, that maybe, just maybe, other books set in this world will happen. As long as there are dragons, I will love them. Oh, one more little fact. David Tenant is the voice for all the audio books. And the trailer for the last book that they showed us at the end. David. Freaking. Tenant. I don’t normally go for audio books, but I might just have to now! 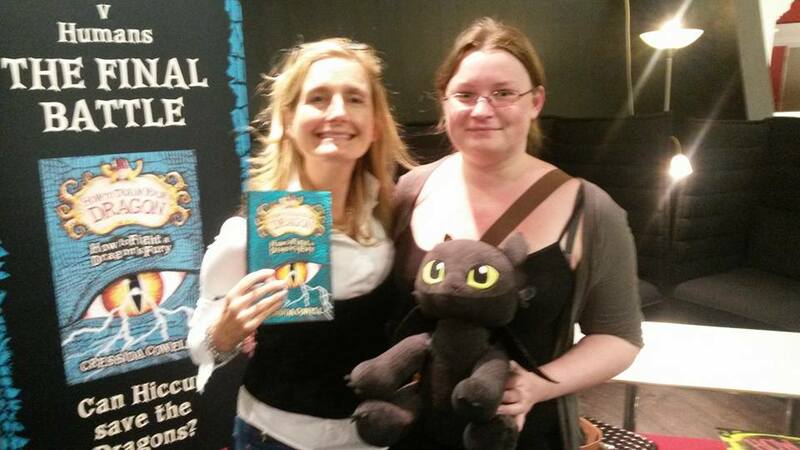 After the long talk, during which I was hugging my Toothless cuddly toy, there was a signing. I managed to end up being last in the queue, but there were two girls ahead of me, around my age, and we chatted and found a fair bunch in common. One of them nearly stole my cuddly toy as well. I just think it’s awesome when people can share a love of the same thing. So it took a while, but I did get to meet her! And I got to tell her how much I enjoyed the books, especially the joy I had of realising that there was a huge plot at work here, and it had been going on since book one. She replied that that was one of the reasons she loved writing books, to hear the reaction of her readers. I got the new book and my original, old copy of HTTYD signed. Then they stamped them with the slavemark, and I got a badge as well! I was just so happy to have gone to this event. I love hearing authors talk about their work, especially when they love it, and I love it. And also dragons. This year, I’ve been making occasional posts about my reading. After all, what is a writer without a little reading? Or, in most cases, a lot of reading. I had a few goals for reading this year. Number one, to read a book a week (or 52 in the year). Number two and three were to do with expanding my reading out from my usual fantasy genre into other genres and non fiction as well. To help with this, and because one of my librarian colleagues and friends pointed me at it, I joined up to be one of the readers circle for the Brave New Reads of 2016. 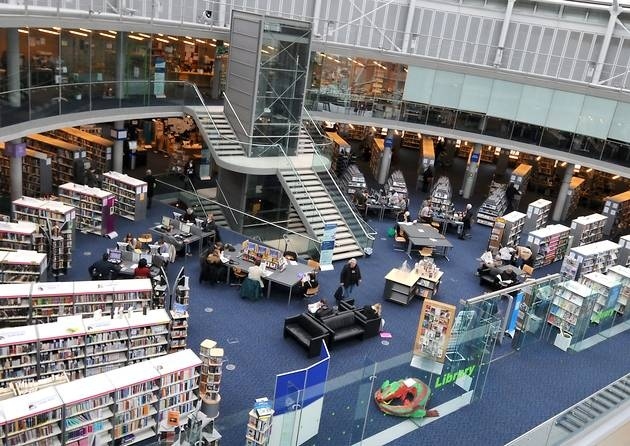 Brave New Reads is where readers choose six books from a long list to recommend to other readers, book clubs and literary events that go on in and around Norfolk. The Reader’s Circle is the process by which we choose these books. So I signed up, gave they my preferences (which they seem to have ignored, and I consider this a good thing for expanding my horizons) and recommendation for books came in from all around, with the only criteria being that a book had to be published less than two years ago and an enjoyable read! We have a long list of 109 books at the moment. Yeah, I know, it’s huge. The fact that each group was only supposed to get 6 titles to review from the long list tells you how many suggestions there were. Thankfully, we also have a huge group of volunteers from Norwich and the surrounding boroughs, as well as Cambridge and Suffolk I believe. I am in Norwich Group 6, with a few other people, and we have been given 13 books to review in stage one. It’s an interesting mix. Especially the poetry books. I mean, I read poetry for my English classes back in secondary school, and I’ve read a couple of poems for pleasure (actually I found an epic poem that I’d love to get my hands on and read the other day, Evangeline by Henry Longfellow) but never a book of them. 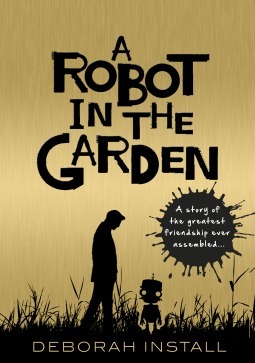 I’m probably most looking forward to the short stories Man V Nature collection and Robot in the Garden. I have managed to read one so far, The Amber Fury. This s because it was online from the digital library since copies of all the books are available from the writers centre, but I have yet to go into town with free time to pick some up. I’ve done a review of it here on Goodreads if you particularly want to read it. So I’ve got quite a bit ahead of me, since I’m meant to try and read this list before the end of October. I feel some weekends being set aside in the near future. 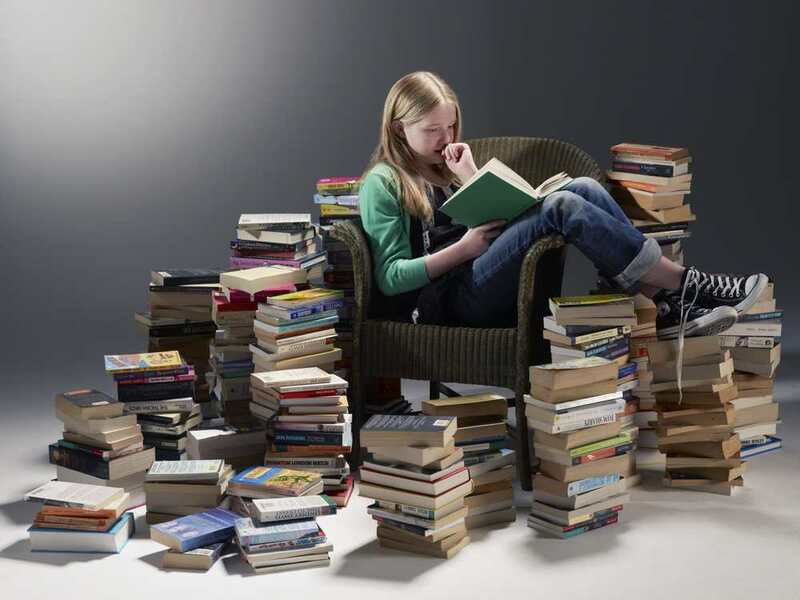 At the end of October, we narrow down the list to roughly 50-60 books. Then we get to read pretty much whatever we want from that list, and in December whittle it down to 25 books. Then, at the end of January, we make the final selections of 6 books which will then become the Brave New Reads of 2016. This means that I am going to do a lot of reading, and a lot more reading of books that I would not normally encounter, and that is pretty much exactly what I wanted from this year or my reading. Of course, I still have a huge pile of books from the fantasy genre sitting on my desk is a messy ‘to read’ pile because I know what I like. Also, this is going to be challenging, because I start my Master’s course at the end of the month, I fully intend to complete NaNoWriMo this year (attempting to choose my project at the moment) and I want to keep up with all my weekly commitments as well. But life’s not fun if you’re not busy, right? 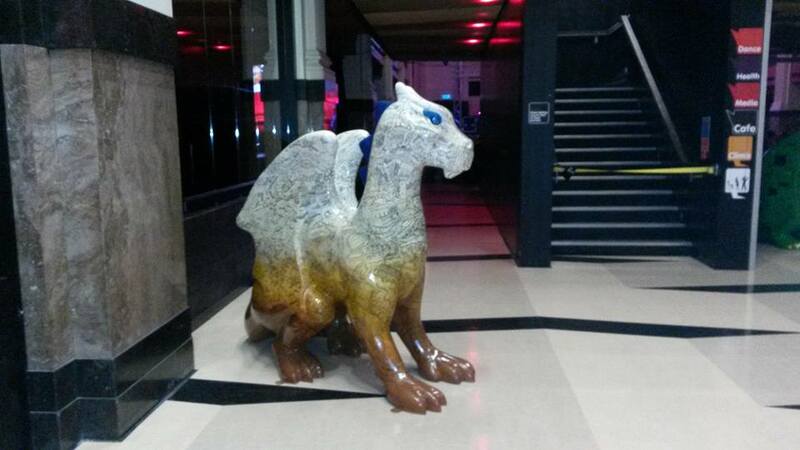 So, I promised you a dragon post, and a dragon post you shall have. 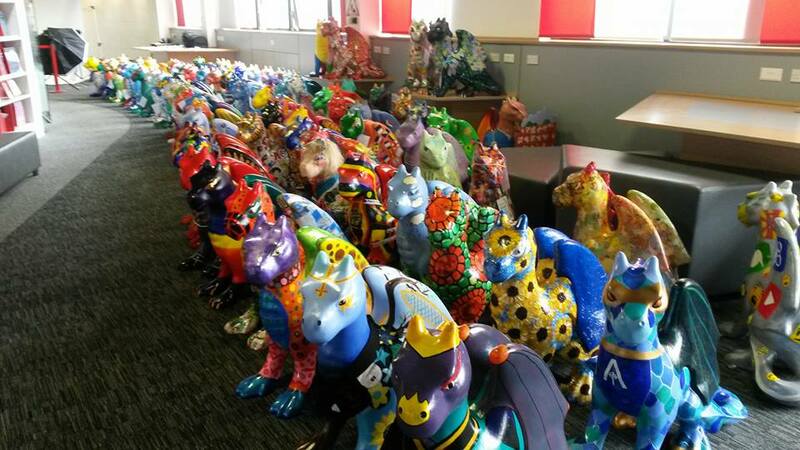 GoGoDragons is going to hit the streets of Norwich on 21st June, and that means that the city is starting to gear up for the plethora of dragons that are going to descend on it. Even my work has been affected. I’ve already written two dragon related blog posts for the library blog, persuaded our finance guy to buy a couple of books (actually, it’s in the picture below), and the best thing? 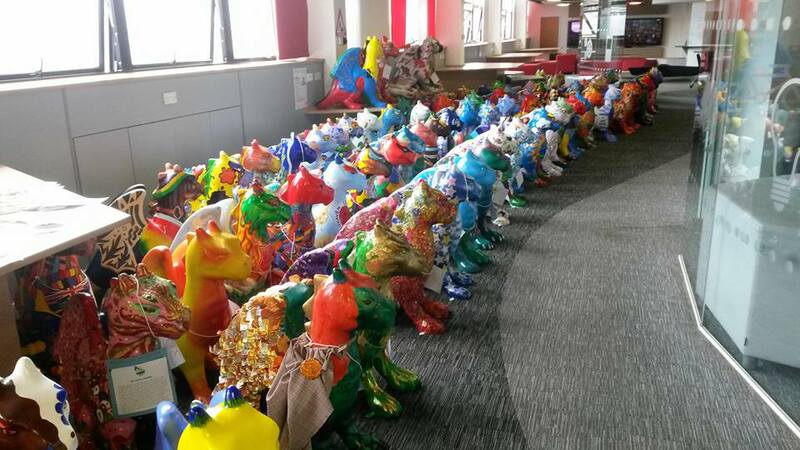 The college is storing all the mini dragon until they get put out on the streets! Aren’t they gorgeous? A whole room, filled with at least 70 of these beauties. Paradise! Just a small selection of the ones that caught my eye. I promise, when they hit the streets, there will be a lot more photos. Individual ones. I will overload you with photos. 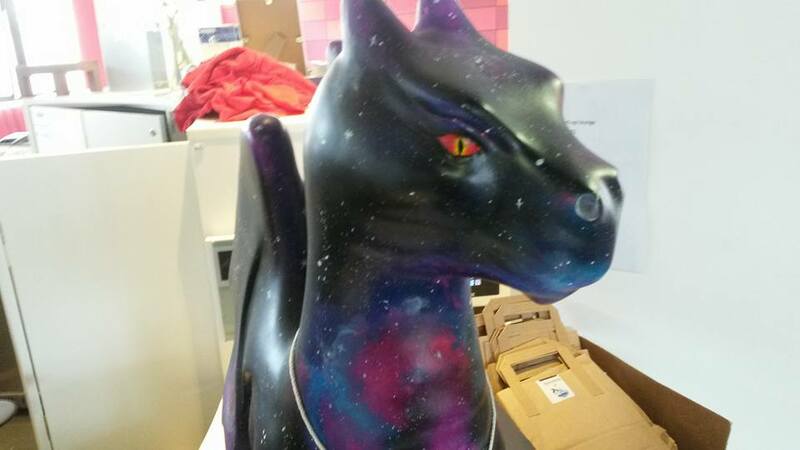 And because of this, the bookstores have been having dragon displays. I showed you one in a recent post. I also found that Jarrolds, our local department store, has also had a big display of all sort of dragon books. So much so that I have another horde of books sitting on my pile. 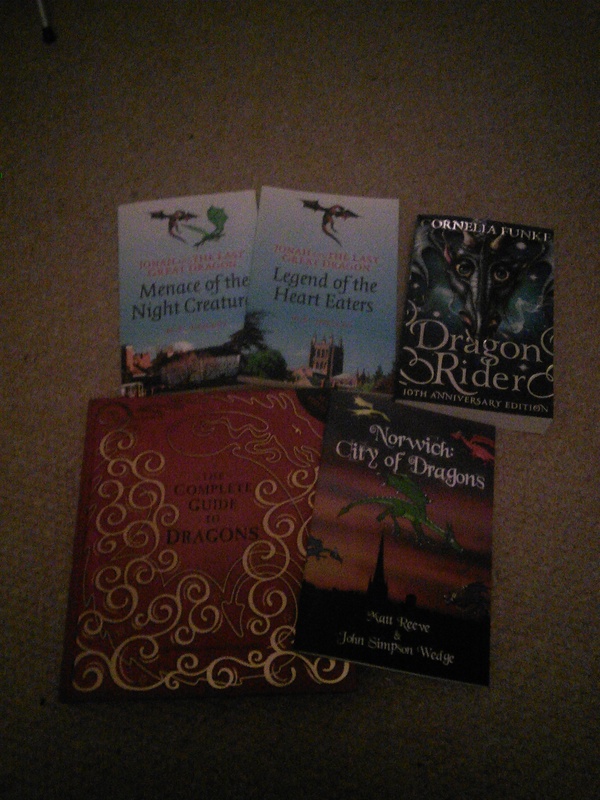 So there’s three story books, a Dragonology book, and a lovely little thin book called Norwich City of Dragon, which has been published locally by Book Wyrm Books. 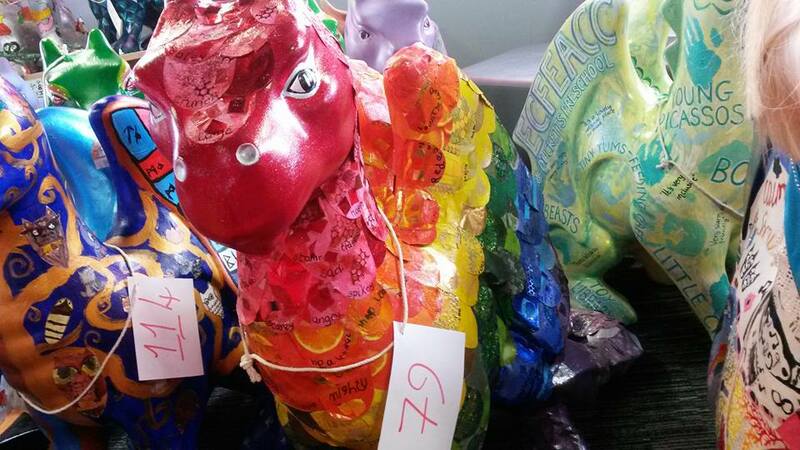 It takes you around the city of Norwich with lots of dragons all over the city, in the spirit of the event. That’s the one I’ve hopefully persuaded the library to pick up a copy of. The two pale blue books are going to be interesting to read. It takes place in Wales, which you know I am involved in (still learning Welsh!) and the author is coming to my local Waterstones book shop early July. 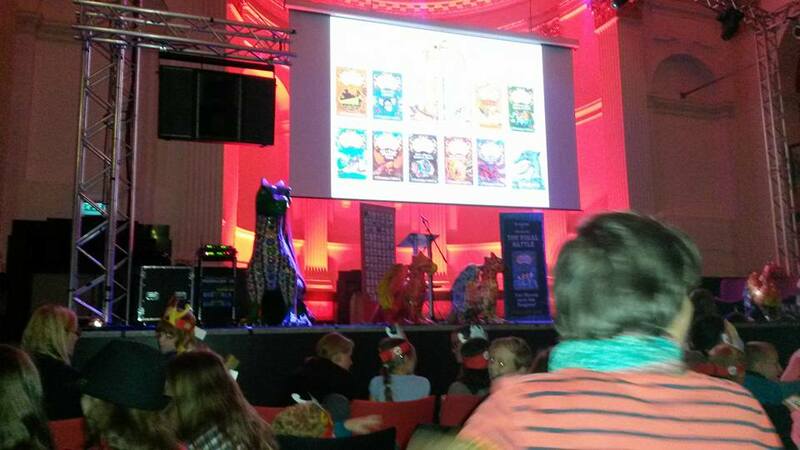 A big dragon themed author event. I am totally going, and I am very much going to enjoy it. I also popped some books back to the library, and in the small shop on the way out, I spotted the display they had in the tourist information shop. And I picked up these two lovelies. 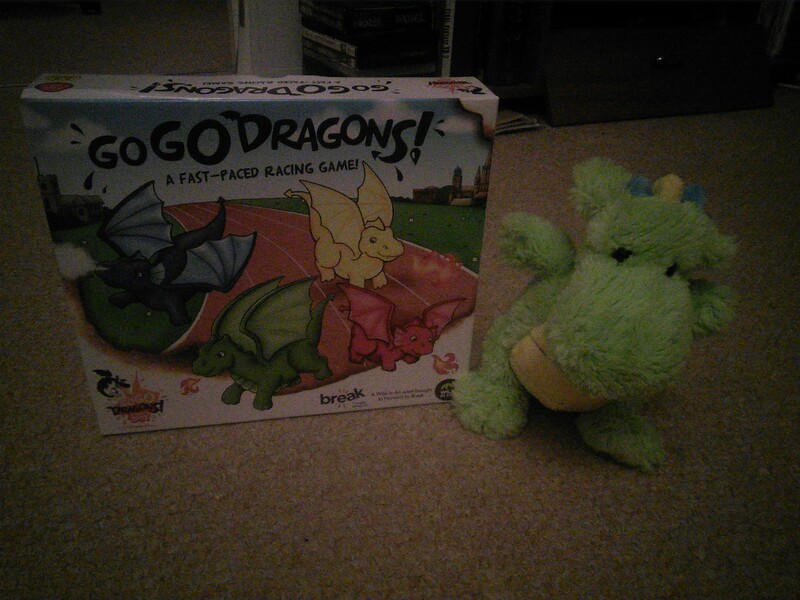 I haven’t had a chance to play the board game yet (I feel sleep due to my cold when people came round my flat) but I love the dragon cuddly toy. It’s super soft, and great to cuddly on the sofa. But, it doesn’t have a name as of yet. Taking suggestions from you, my lovely readers. 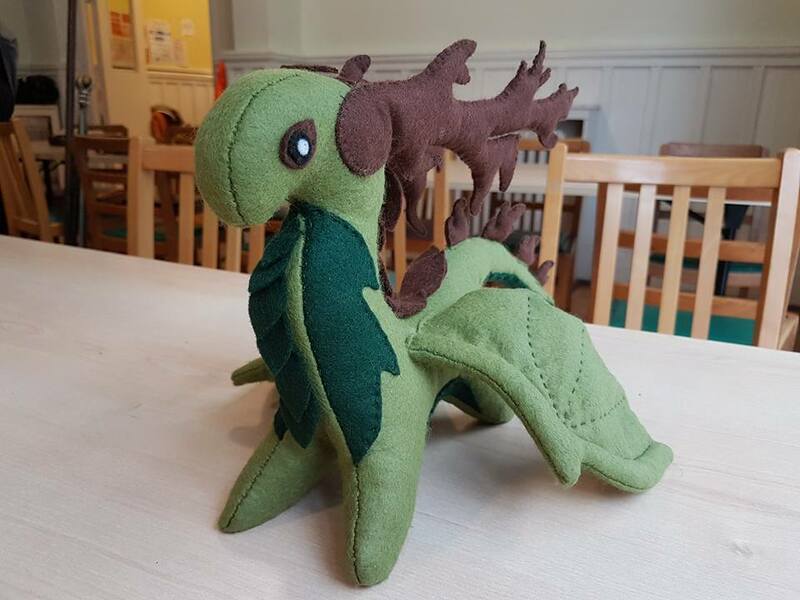 What do you think I should name my Norwich dragon?